Preheat the oven to 100oC. Finely chop the white chocolate, put it on a baking dish and bake it in the preheated oven for about 30 minutes. Stir every 10 minutes until the chocolate acquires a dark golden color. Put the butter in a saucepan, melt it over low heat, and then let it cool down. Beat the eggs with the white and brown sugar in a bowl, until they become fluffy. Add the melted butter, vanilla, salt, flour, the caramelized white chocolate; stir and spread the mixture in a pyrex glass baking dish. Cut the blackberries in half and boil them in a saucepan with the sugar, stirring continuously. Dissolve the corn flour in some water and add it to the red fruit. Mix, until the jam is set, then remove from the hot plate and add the pomegranate balsamic cream. 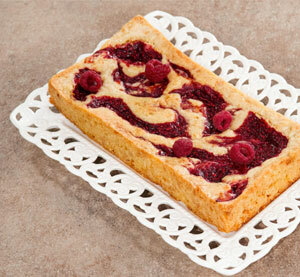 Pour the jam over the blondie dough and dipping a knife, create various shapes. Bake in a preheated oven at 175o C for 25 minutes. Let the Blondie cool down well and serve.